I don’t like New Year’s Resolutions – they don’t work! This is the time of year people go on a juice-fast to lose weight, give up alcohol ‘forever’, become a 100% raw foodie overnight, join a gym for their ‘dream body by the end of January’, say they will stop stressing, etc. Rarely does anyone achieve their resolutions – instead they perceive themselves as a failure, feel guilty and miserable, and give up altogether. Well, if putting unrealistic expectations on ourselves isn’t the biggest recipe for disaster with our fitness and health, then I don’t know what is. Putting extreme pressure on ourselves and having such unrealistic expectations, ultimately DOES result in failure – the juice fast person usually gains weight when they start eating normally, the raw foodie will feel hungry and crave food endlessly, the non-drinker will probably go on a booze binge, and the gym membership is paid for but unused after the 14th of January. This of course just results in a vicious cycle, and the person is back where they don’t want to be; without progress – and actually feeling worse about him/herself. As a personal trainer and nutrition coach, the biggest thing I notice when people come to me for guidance with their fitness and health, is that previously they have been made to believe they have to do everything at once, and that “all or nothing” is the only option and solution. When in fact, this extreme way of thinking is destructive, counter-productive to progress, and is actually guaranteed to set someone up to fail. Unfortunately this approach is promoted everywhere we look in the media, and sadly, also by many fitness and health ‘professionals’. So, rather than people putting unrealistic ‘resolutions’ in place this first week of January, I would love to see achievable ‘goal setting’ instead. For example, “Juice Fasting “, could be replaced with “Drink a fresh juice daily”, which is much more manageable and productive in the long run. Yes, there may be some people who can manage extreme and sudden changes, and maintain them, but it is a miniscule number of the population who can succeed this way – the majority of people find it overwhelming and simply unachievable. The best way to remove an unhealthy or other negative aspect from our life, is undoubtedly to GRADUALLY replace it with a better option, and then soon we find that we do not miss it anymore – in other words, we create a new habit. Numerous research studies have been carried out demonstrating it takes several weeks to form a new habit; to the point where the new behaviour has become automatic and comfortable. So expecting everything to happen overnight, and that we will be able to maintain such a quick change FOREVER, and lots of changes at once, is unrealistic, and simply not healthy for the mind or body. If changes are required for us to live a better life, it is important the transition is actioned in a way that we can manage for the long-term. For example, many people aim to go vegan overnight. They throw away all their animal products, and do not research how to replace them with healthy plant options. As a result they often don’t eat properly, so end up with low energy, food cravings, and basically malnourished. Then they inevitably start to think eating plant-based is unhealthy, when nothing could actually be farther from the truth. No-one can eat only salad though, or live on vegan junk food like faux meat products with chips, and still be healthy. It is important we obtain a certain type and amount of macronutrients and micronutrients from our food; so our body and mind can function well. Knowing what are good plant protein sources for example, is essential. Okay, we do not need to eat the huge amounts of protein the animal product industries would like us to believe is necessary, but we do need to eat a certain amount of protein daily (which is easily obtainable from particular plant foods). If someone spends time preparing for the transition to eating plant-based by establishing how he/she will create this new habit, and what their food goals need to be for long-term health, then he/she will guarantee success. By increasingly adding alternative plant proteins and non-dairy/egg options to his/her diet over a few weeks (while gradually using up their animal products), someone will soon find that all the animal products he/she was consuming have already been replaced, and are not being missed at all. Going ‘cold turkey’ (pardon the pun), without researching and finding alternative products, is simply too difficult for most of us. Change takes time. Therefore, to succeed with goals (by creating new habits), planning is imperative. If we do not have a system in place for how to achieve what we want, we are destined to lose. As Benjamin Franklin, very wisely once said, “By failing to prepare, you are preparing to fail”. 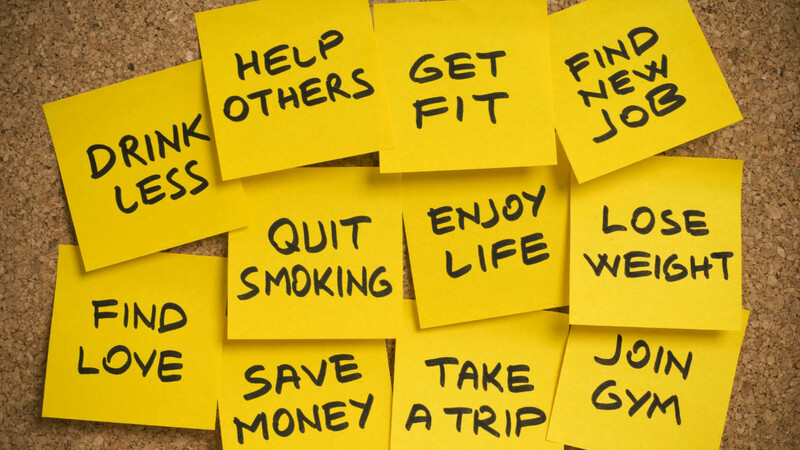 So this January, let’s all make New Year’s Goals instead – which are effectively planned! A fantastic way to do this is to use the tried-and-tested ‘S.M.A.R.T’ goal-setting method – by making sure goals are Specific, Measureable, Achievable, Realistic, and Time-based. Let’s all spend some time really thinking about where we want to be this time next year. Let’s ask ourselves questions that ensure we succeed – What do I want to achieve? How am I actually going to do it? What challenges am I going to face? What preparation do I need to make? Do I need a coach/mentor to assist me? How much time will it realistically take me? What will motivate me to keep going? What stages of progress are required for me to succeed? Please let us not start 2018 with the same old resolutions that most know deep down are not going to be resolute at all. Anyone can set a resolution that doesn’t eventuate, and which ends up on next year’s list. Setting goals though that are achieved through a clear plan and dedication, and which can be maintained, well, that is something very special indeed. With best wishes for 2017 – this is your year!